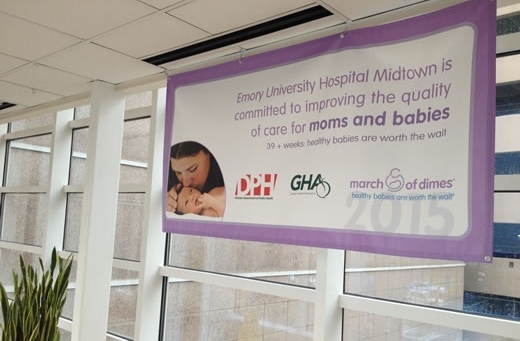 A March of Dimes "39+ weeks" recognition banner hangs inside Emory University Hospital Midtown, recognizing the hospital's work in giving babies a healthier start in life. Emory University Hospital Midtown has been recognized by the March of Dimes for giving babies a healthier start to life by reducing the number of elective inductions and deliveries performed before 39 weeks of pregnancy. A "39+ weeks" recognition banner now hangs in the hospital to show off the good work. 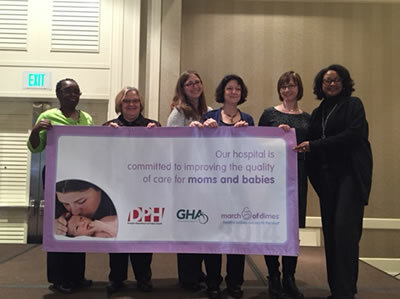 The quality improvement program, sponsored by the March of Dimes, the Georgia Department of Public Health, the Georgia Hospital Association and the Georgia Obstetrical and Gynecological Society, asks all hospitals in Georgia that deliver babies to sign a pledge implementing firm policies to reduce early elective deliveries and support ongoing efforts to reduce Georgia's infant mortality rate. The program encourages hospitals to adopt the American College of Obstetricians and Gynecologists (ACOG) guidelines to not induce labor or perform cesarean sections before 39 weeks gestation without a medical reason. "Emory University Hospital Midtown was an early adopter of this program in January 2010, responding to medical evidence that complications, such as low birth weight and respiratory distress, could be significantly decreased if elective delivery before 39 weeks was avoided," says Carrie Cwiak, MD, MPH, associate professor in the Department of Gynecology and Obstetrics, Emory University School of Medicine and physician lead of this program at Emory University Hospital Midtown. "The program has continued to be successful at this hospital because the administrators, physicians and nurses have worked as a team to assure that no deliveries, whether inductions of labor or cesarean sections, are performed before 39 weeks for purely elective reasons." Cwiak continues, "Best practices focus on allowing for the natural progression of labor and infant development to occur in healthy pregnancies." In order to receive banner recognition, hospitals have to have clear policies in place to prevent early elective deliveries, plus show data to demonstrate their rate is five percent or less. Emory University Hospital Midtown complies with a less than five percent rate of early elective deliveries. Joan Ragan, Lori Knight, Gloria Myles, Carrie Cwiak, MD, and Joi Bell-Blanding. "Patients are being educated in prenatal visits and also on the labor and delivery floor that scheduling deliveries based on convenience, such as before a family vacation or because parents want to select a desired birth date, do not provide the safest starts for newborns and the families caring for them," says Joan Ragan, RN, specialty director of Women's Health Services at Emory University Hospital Midtown. "And patients have responded positively to this initiative." Worldwide, 15 million babies are born too soon each year and more than one million of those infants die as a result of their early births, according to the March of Dimes. Babies who survive an early birth often face the risk of lifelong health challenges, such as breathing problems, cerebral palsy, learning disabilities and others. In 2014, the March of Dimes launched the "Healthy Babies are Worth the Wait" campaign through a partnership with the U.S. Department of Health and Human Services and the American College of Obstetricians and Gynecologists. It urges women to wait for labor to begin on its own if their pregnancy is healthy, rather than scheduling delivery before 39 completed weeks of pregnancy. "Our goal is to provide the best quality care to our patients, including our youngest patients," says Gloria Myles, RN, unit charge nurse for labor and delivery services at Emory University Hospital Midtown. "By working with a great team of people, including external organizations and internal care givers, we are giving newborns their best chances to a healthy start in life. We look forward to this continued collaboration." It is also important to note that Emory University Hospital Midtown is equipped to care for complicated patients who require delivery before 39 weeks for a mother's elevated blood pressure, abnormal testing or other medical reasons involving the mother or baby. In those cases, delivery is no longer considered elective and providers and staff assure that babies are delivered in a timely manner. The hospital also has a Level III neonatal intensive care unit with specially trained doctors, nurses and other health care professionals who are experts in the treatment of ill and premature newborns, who may arrive before their due date.